Few things can throw a monkey wrench into your fitness progress like a trip or vacation. When you travel, everything changes. Your energy level, schedule, resources and even time zone. Because of these shifts, both your fitness and your vacation can become severely compromised leaving you wondering why you left home to begin with. I’ve been there and done that, but now I have this whole fitness-on-the-road thing mastered and both my vacation and fitness is top-notch when I travel. Here are the essential tricks to having your cake and eating it too while on a trip. The first thing to realize is that it’s going to be almost impossible to stick to a super strict and time-consuming workout routine. The more time and effort your exercise required while at home, the more it will require while on the road. Most of the time, you’re simply not going to have those resources, especially if you are trying to cram as many plans into your trip as possible. And even if you did have a lot of time and energy, you’re probably not going to want to spend it all in a gym anyway. When I’m on vacation I want to hit the beach, check out the zoo and hang out with friends and family I haven’t seen in a long time. I didn’t spend all of that money and effort to travel thousands of miles and plunk my tail on an exercise bike. So go easy on your super strict routine. Maybe plan the trip so it coincides with a few rest days or the de-loading phase of a macro cycle. Whatever you do, don’t beat yourself up if you can’t stick to your normal routine. That just drags your mood, fitness and vacation through the mud. It’s only right to start thinking about bringing your own equipment on the road. There are many advantages to doing this. You don’t have to make the time to get to a gym freeing up loads of precious vacation time. Since you can workout anywhere, you can still enjoy the view from your beach house and not settle for the walls of a basement hotel gym. You can exercise while still in the company of those you came to see. Heck, you may even talk a friend into working out with you for a few sets. 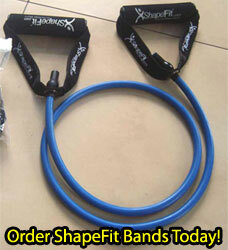 There are two distinct types of portable equipment; elastic exercise bands and suspension trainers. Both have their pros and cons, but either one will give you a great workout while on the road. Elastic exercise bands are a very popular choice. They are pretty inexpensive, easy to set up and a cinch to use. Since they are able to mimic nearly any movement you can imagine, they are very popular with those who insist on replicating free-weight or machines movements. So if you believe a lateral raise is the worlds best shoulder exercise then these might just be your thing. The downside to using elastic exercise bands for resistance is that it’s not quite the same as real weight. Yea, yea I know resistance is resistance, but how it’s delivered can make a difference. As you may know, the resistance of elastic bands increases as it stretches. Some might sell this as a plus saying that it forces your muscles to work harder as the band stretches. Of course the band also reduces the resistance as it returns to its resting length. When using real weight, you have a much more consistent level of resistance through the range of motion. So while the bands are a glass-half-full or glass-half-empty approach, real weight is a glass that’s filled to the brim. Overall, elastic exercise bands are great for those who need to mimic exact movements, but are willing to sacrifice some resistance in some form or another. The other option for the fitness road warrior are suspension straps. These straps allow you to use your body weight for resistance, thus allowing you to work with the workload of real weight. Many of the exercises are very close in feel and function to what you might do on a machine or with free weights. However, some of the moves are quite different from anything you may have done before. This may require a bit of practice to become proficient with the unusual movements so you can milk every drop of potential from the device. 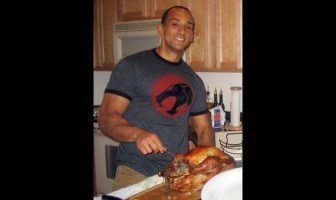 They will still provide you with a great workout, but you’re not going to be able to do that lateral raise exactly like you would with a set of dumbbells. Whichever method you decide on, it’s important to be proficient in using it before you go on your trip. It’s natural for athletes to believe that the tools and exercises they are accustomed to are the best methods. Changing up to different tools or exercises can sometimes leave the athlete feeling like the new method isn’t quite as effective. We certainly want to avoid that feeling while on the road. We don’t want a B grade workout when we are able to exercise, but using straps or bands can feel just like that if we don’t use them on a regular basis. Using the straps and bands in your normal home routine will help you become very proficient at using them, and feel right at home when you use them on the road. This will help you to maintain the feeling of getting a great workout while on the road. Sometimes we simply don’t have much time to get any exercise at all while traveling. There might be only a few minutes here and there and that’s about it. In this situation, I recommend using a technique called chunking. Chunking is when you use a little bit of exercise multiple times a day for an accumulative result. For example, a simple 10 minute elastic exercise band routine might not do or feel like much, but if you can do that 3-4 times in a day it will add up to be quite a lot. The advantage is that chunking won’t require you to shoe-horn a massive amount of time into your schedule. You can have a little here and a little there when you can afford the time and still get your reps in without pushing your vacation out the window. The last piece of advice is to plan your workouts early in the day. We all know how the daily schedule can take over and impede on workout plans while at home. While on vacation it’s even more difficult to stick to a late day workout schedule due to the freestyle nature of vacation planning. For this reason alone, I always recommend getting your workout in during the morning. It might seem like a sin against vacation to get up early, but getting in a workout early in the day will leave you feeling refreshed and energized thus adding some value to your trip. I’m not saying you have to get up 2 hours early, just 20-30 minutes can do wonders. Once your workout is finished you can enjoy the rest of the day without worrying about when you will get your workout in. Above all, remember that both your workout and vacation plans can coexist with one another. You don’t have to give one up for the other as long as you stay flexible and plan ahead. In my next article I will focus on some of the ways you can still stay lean and eat well while on vacation.